Home Commercial Fire Ants will no more pose a problem in your life, know how? Dull red body coloration is a typical identification feature for fire ants, which can vary from reddish brown to reddish black. Fire ants most typically exist in dry, sunny and flat conditions. Loose earth seems to be a preferable location for mound construction. These ants seem to be least active when the day time is hottest. Also, these creatures stay away from shade and darkness and exist commonly in lawns and open fields, when compared to forests. Fire ants are more aggressive than most native species and so have pushed many species away from their local habitat. These ants are renowned for their ability to survive extreme conditions. 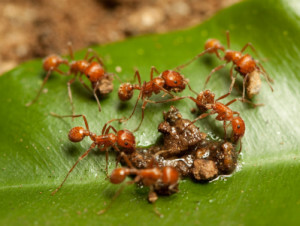 Although many measures are easily available, which sound ideal in controlling fire ants, but sometimes it gets essential to contact a local pest control expert who is equipped with the needed tools and equipment to wipe away and even keep away these ants from your property. When trying to eliminate and manage fire ants even experts say that having an understanding about the habits and biology seems mandatory in ensuring permanent and long term freedom. Most household methods may seem effective initially, but can prove to be welcoming back these annoying creatures after a short period of time. So, in order to get a permanent solution it’s recommended to get professional help and ensure peace of mind, by calling Swatter Pest Solutions LLC today. In the end, the life of you and your loved ones is precious, so why let such annoying fire ants cause any trouble, get expert help from Swatter Pest Solutions and get easy freedom with solutions that are long-lasting.